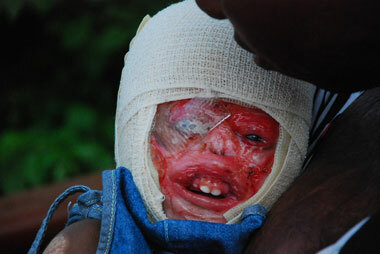 Agnes Wabiwa, a Congolese burns survivor, aged 10 months in early February 2012, just before she went in for her first two operations at Shriners Hospital in Boston, USA. 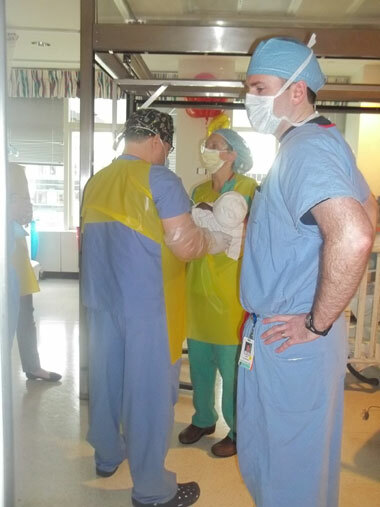 Agnes' first two operations at the Shriners Hospital were to insert a tracheostomy and also a G-line. 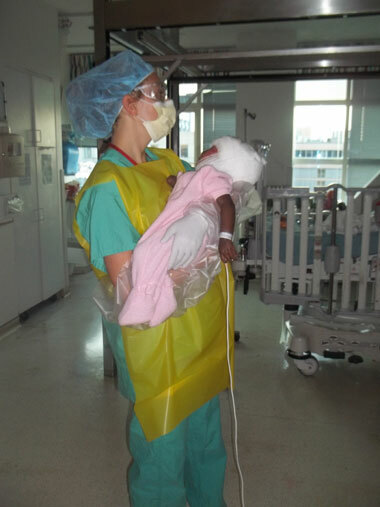 A tracheostomy is done to bypass an obstructed upper airway or to clean and remove secretions from the airway or as in this case, to more easily and more safely, deliver oxygen to the lungs. This is essential to allow Agnes to breathe properly in future procedures. Agnes no longer has a nose, just two small former-nostrils. Her mouth-opening is also restricted. The G-line is to allow her to get the extra nutrition that she so urgently needs. Agnes is severely underweight for her age. Getting a free airfare for anyone these recessionary days is almost impossible. 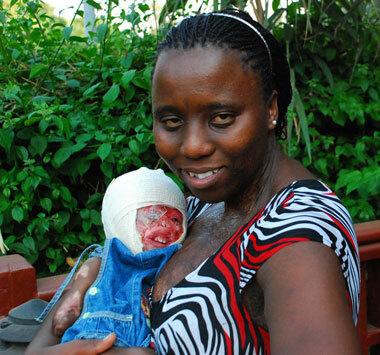 But the staff on board the airlines did their very best to make Baby Agnes comfortable as she flew from Africa to America in February 2012. 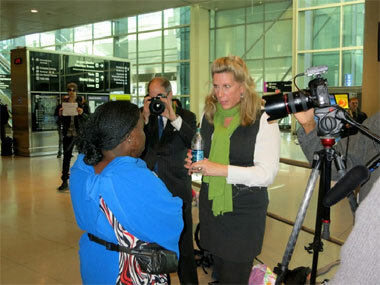 Only a small reduction in the cost of flights was achieved from KLM but its partner Delta kindly provided a day room in an Amsterdam hotel for both Mitta and the infant to briefly recover before their onward flight to Boston. 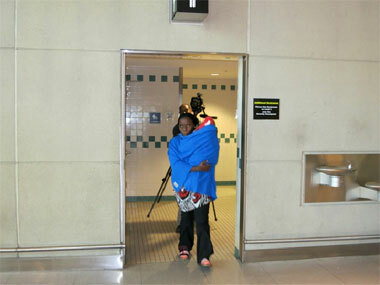 The airline also gave the infant a blanket. 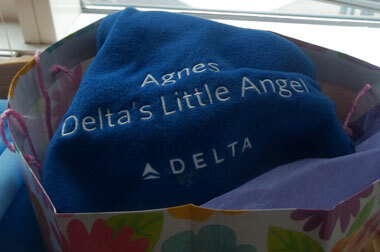 The speed of embroidering a snug public relations item was impressive! Thanks to the American Consul in Kigali whose conversations with the Dutch Embassy may have helped matters. 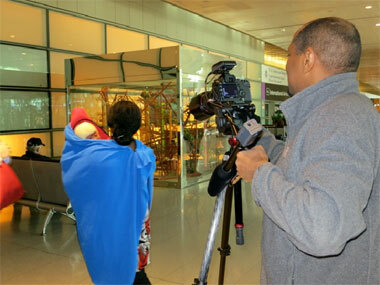 International documentary producer Junius Hughes has known Children of Fire since 2006 and is now one of Agnes' guardians for her time in the USA. 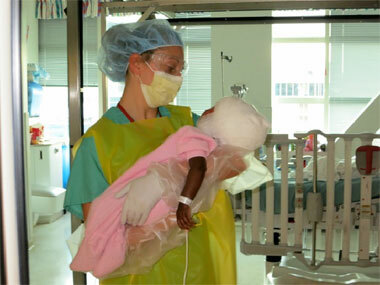 Mitta holding baby Agnes, at Shriners Hospital in Boston. Baby Agnes seems more wires and tubes than baby! Everything to feed her, give her air, monitor all her vital signs.